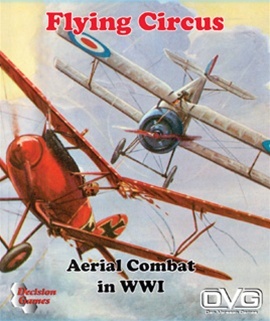 Flying Circus: Aerial Combat in WWI depicts the fun and flavor of World War I aerial dogfighting. You fly the colorful and agile aircraft of WWI as you make history in the world’s first use of aircraft in a military role. This is the basic game. 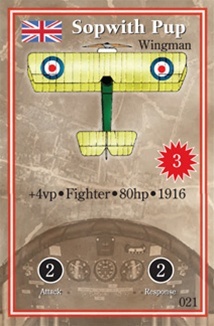 You have everything you need to play single aircraft duels to multi-aircraft dogfights. Each aircraft has its own unique characteristics reflected in its ratings and special abilities. The basic game rules cover all the maneuvers that made WWI aerial combat: barrel rolls, stall turns, Immelmanns, vertical rolls and Chandelles. 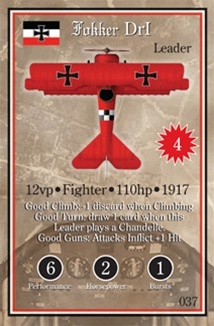 Outmaneuver your opponent to line up your guns and watch his planes go down in flames! Gamers who have played the Down in Flames game series will find many similarities in game play, however, previous experience is not necessary. The basic game rules can be read in less than 20 minutes and you can play your first game immediately. Includes: 110 full color playing cards & rules sheet, small 1 inch box.